This past weekend, we were blessed with a sunny Saturday, and I got right to work in the veggie garden as the rest of the week's forecast looked dreary. 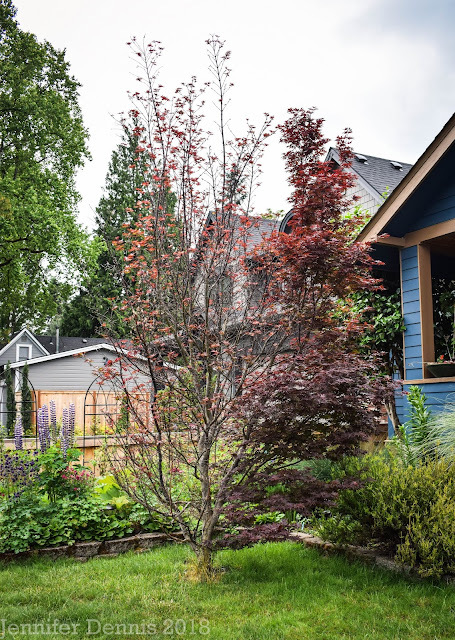 My primary reason for creating this new little veggie garden was to truly utilize every square foot of our little 5700 sq ft city lot and get us eating better. An added bonus to the garden is that my little kids think it's really cool and are excited to learn about growing things. I've been a bit nervous taking on a garden as I really don't know when to plant things or how to plot it all out, so I've just decided that I'll have to learn on the job, make some mistakes and in an effort to learn and minimize the mistakes, I've been reading many many fellow garden bloggers and soaking in all their wonder tips and tricks. Carol over at May Dreams Gardens is following the Farmer's Almanac moon calendar...so..why not? I planted a second phase of Sweet Pea's behind the new raspberry starts to utilized space better. Doubtful I'll be able to use that same space again next year. Then I created six rows in my little garden plot, they are about 6 ft long. 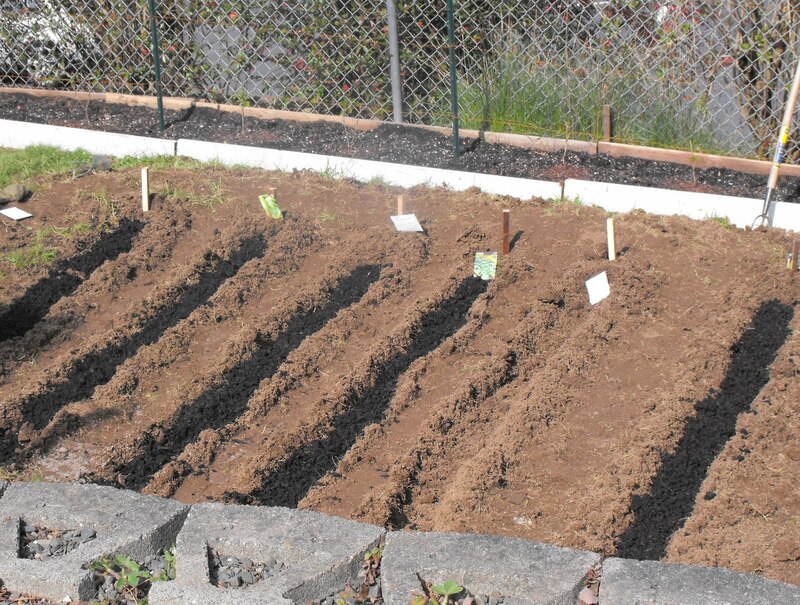 After that, I added organic compost to the rows as I have no idea how good the soil is. 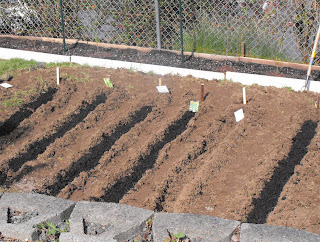 I will say this, while I would have loved to have added compost to the entire garden and tilled it in, I decided not too in an effort to reduce costs. Part of the life philosophy my hubby and I have adopted is to live debt free and to be very thoughtful about our spending. 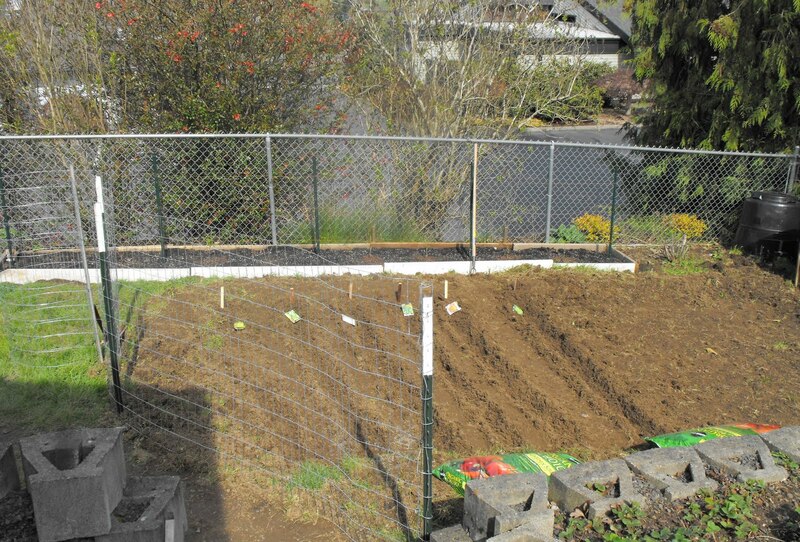 Therefore, adding compost to just the rows saved me gobs of cash. (notice I did not put compost in one of the rows meant for carrots..not sure how old the compost is..soo, not taking any chances). Then I followed each seed packets instructions for covering up and viola! 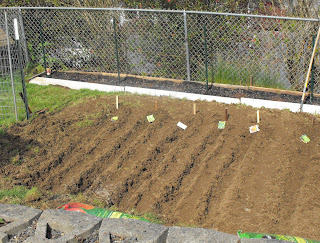 Lettuce, Swiss chard, carrots, snow peas, spinach are in the ground! Let's hope the birds don't eat them. It sounds like you're doing great there. I'd love to have such a nice space to grow veggies in. Your kids will love being able to pick snacks while out playing. I think your idea of adding compost where you're growing sounds like a really good idea. 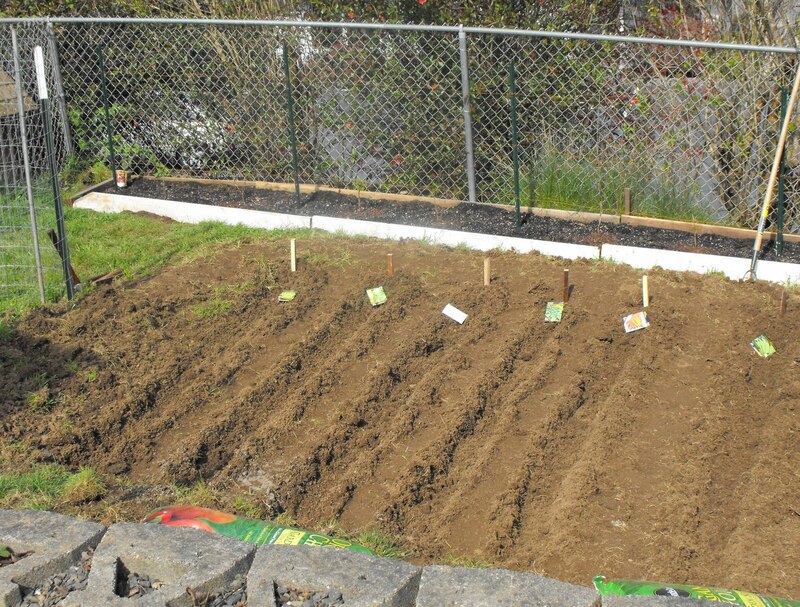 Your garden looks great and it sounds like you've learned alot about getting it going. Good luck with it and from one rainy gardener to another I hope it all comes together for ya.